I got around to tearing the Black Widow apart today. 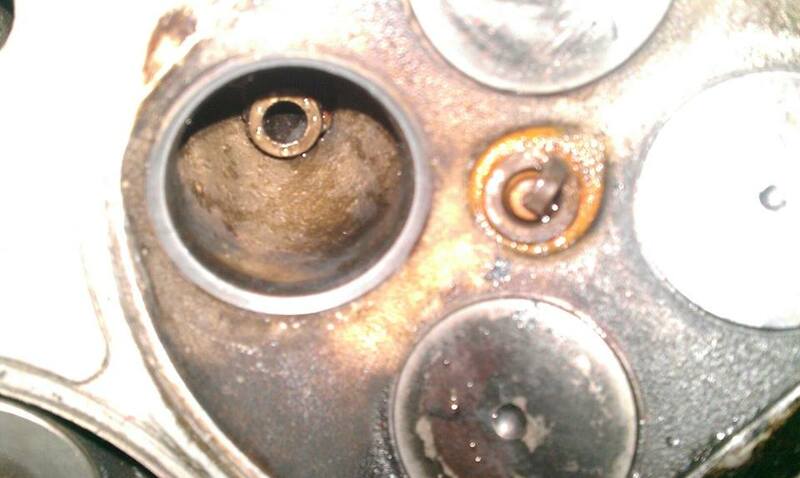 As i had expected, cam lobes down on all four valves on cylinder 2 that busted out. This explains broken cam bolt on intake, and both cam gear pins sheared..Looks like I have 4 bent valves for sure..
Then the rain came.. Never fails.. But with the rain brings the I "toad" ya so's - my garage guard frog. Time for a drink while the storm rolls through..I hadn't had a drink in a long long time..So i went fishin with "Evan" and the boys. Then went back out to play in the rain. I couldn't stand being so close to complete teardown. I used a oil filter chain wrench to knock piston out of bore with a 3/4 wrench and a cheater pipe, no fingers were hurt this day, no blood was had, no stitches. There were a few close calls however, with that rod bouncing around trying to catch me slipping. And outta there.. Slightly bent rod. Anyone got a good spare H beam they want to sell me? Kenny Howard? Anyone? And 4 out of 16 definately bent..Possibly more. 10 out of 16 hit the pistons when the cam gear broke off and both pins sheared. Probably have some cracked valve guides. The proof is the dimples on top of the pistons i shaved 1.5mm off of(stock n/a pistons) and thickest rsi cometic metal headgasket and arp studs. 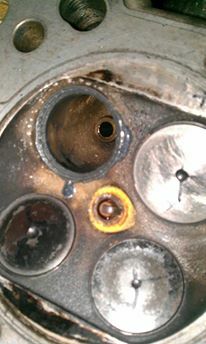 In conclusion, bore number two had a crack in it for what appeared to be a while, as it lost coolant ever since i installed that $62.50 block. I have a rusted chunk of the bore -3 out of 4 corners are rusted quite a bit, showing it had this problem for a while. 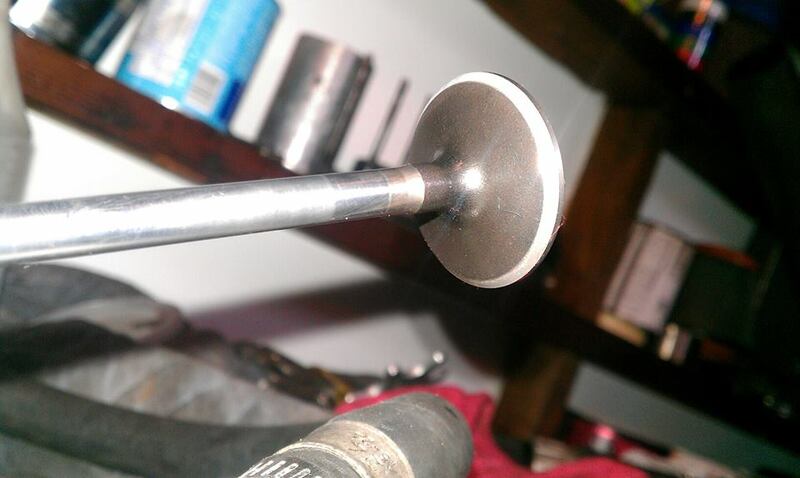 The bore ended up splitting under vacuum at around 2500 rpm cruising, and breaking the top of the piston and wrist pin off the piston, and in half, keeping the broken piston wedged at the top of the bore. This introduced extreme pressure into coolant and blew both freeze plugs out. Then all four valves bent in number two cylinder as the h beam rod kept beating it up into the head. This broke the intake cam bolt and sent the intake cam gear flying under the car- and threw the timing belt off. 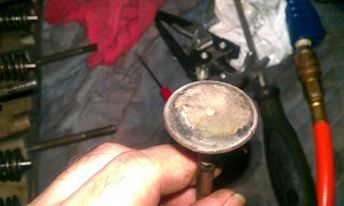 This also caused the exhaust cam gear to shear dowel pin. The rod in number two then beat the crap out of the rest of the block and bent very slightly. Now time to save and rebuild it to be better. Just a simple cheap tip..... 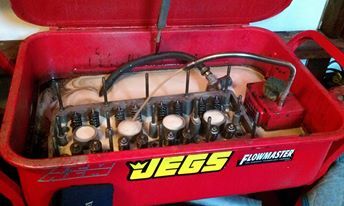 If you run a stock block 93+ let's say you can just bolt the head on and rock it, no need for making valve reliefs or taking of the top of the pistons. More than a few of us have done it. Works just fine and holds 300+ whp without blinking an eye. Super cheap and reliable and while saving up for another h beam build. Correct Info... 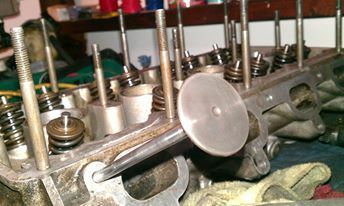 UNLESS the head has been machined /milled to be flattened. As i said Much earlier in this thread(maybe the first time before i deleted it all). Measure your heads to see if they are unmolested. 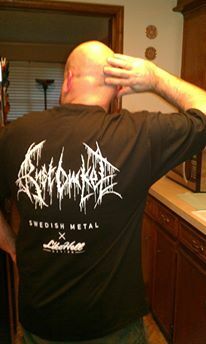 The first time around i stuck this head on a Na bottom end and rocked it. Then i removed it and put a flat bar too it, because it was warped i had it machined. 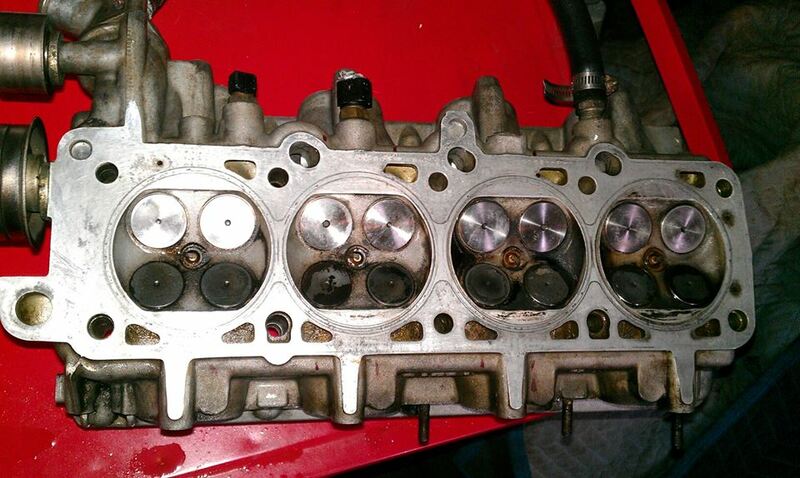 When i got it back they took way too much material off this head as well, then valves would not clear, hench my piston sanding and thick head gasket shenanigans. I cant express how impressed i am at those h beams off ebay!! "Yes, we have stock for this rods in US now, the price is 213 USD with free shipping, you would receive it in about 3~5 business days once payment is cleared. If there is no problem, we will send you an invoice to --------------is that ok?" Dang, $213?!!!!! Free shipping, well, this may be the way to go..
then i emailed back i only needed one, here is their reply..
"Sorry for my misunderstanding, yes, we can offer one piece, but it can be only shipped from HongKong, the price is 75 USD including shipping fee, which would be delivered in about 4~7 business days. If this is ok with you, can you tell us the serial number on the rods, so we can get the right one for you. Did the old water in the runners trick to see what valves were leaking. pretty much all of them are leaking a very little amount water past them. 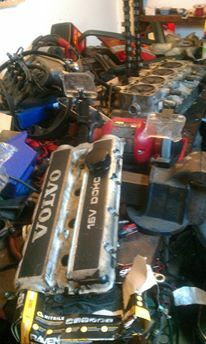 So it's time to go bigger or use the other 16v head i have. A Friend and I pulled the engine out last night. Here are some pictures. 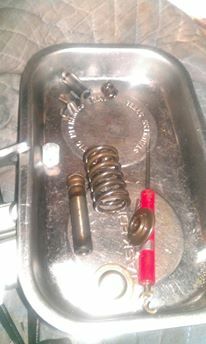 Its possible previous owner may have let engine sit and freeze with water in it before i got it, or any other number of things could have happened. That rod took a beating, i am pretty impressed with the quality of it honestly. 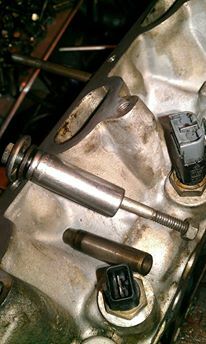 Considering i have never seen any rod shear a stock Volvo Wrist pin in half, without folding completely over. I got alot done in the last couple of days. 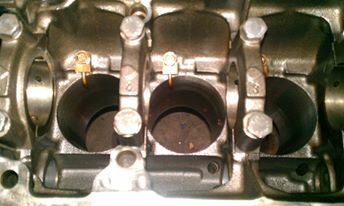 Pulled the pistons out of old $62 block, and the rods. Three pistons are ok, and i have another three left over from last block. So gonna still use those, because i can, and because babies are expensive. I have the forged pistons, but not ready to take that plunge yet. I Pulled the parts head off of sons car, it was trashed, big crack in the middle of it. So it got way overheated. I used some valve guides from old head and some valves from old head to make mine better. I have new valve seals so i used those. Made a dandy little tool out of 12mm 1/4 inch deep socket and a long bolt and nut and a few washers to pull valve guides out with. 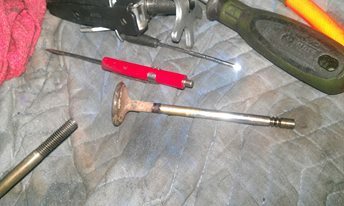 I damaged the first four and was about to give up when i finally figured out the right combo of tools to get the guides out of one head and into another with a 10mm socket tapping them back in carefully. Seemed to work out well, but not patting myself on the back yet, till its running again. Putting the valve stem retainers back on was the most difficult with my fat fingers, but I got it all done without paying a machine shop a dime. 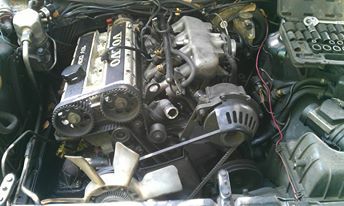 I put my 91+ block with squirters up on the engine stand to get ready for the transfer of parts. Waiting on a new full set of rods to come in so i can reassemble and hopefully have some more fun with this used junk stuff. Enjoy the picture show. 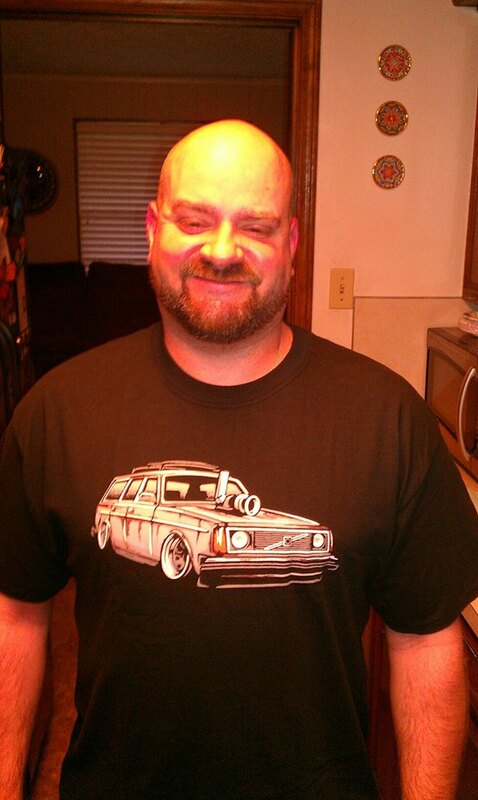 Of course i had to get the shirt, and took a selfie. Got new taillights, new fan, radiator, correct 16 v throttle linkage and cable, some interior bits, some under hood bits.. Of course the 16v badge. Always with the cracks on parts 16v head.My son overheated the piss out of it, it had no coolant and i could blow dust off the dip stick-no oil. That poor car, kids.. SMH. 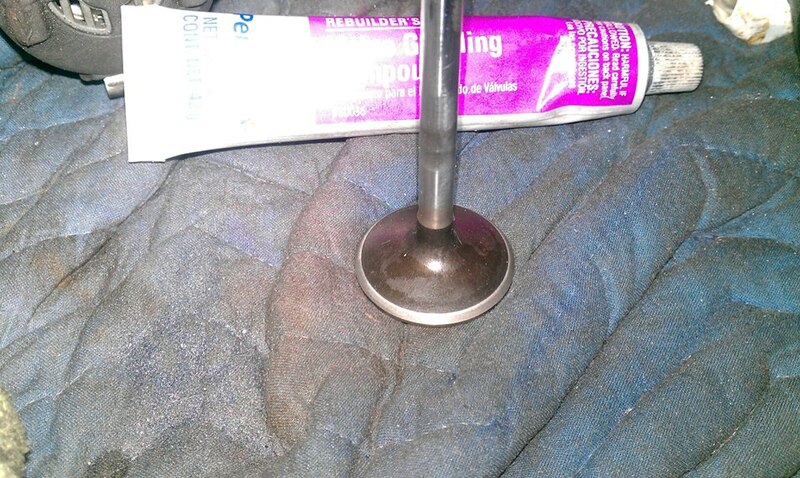 My dandy valve guide removal tool. And a guide. So i rebuilt it with old chit, from other head.Old valves in ,Old valve guides in, and new valve seals-all cost spared ;) . Now i wait on rods. Last edited by haltechsupra; 10-08-2016 at 03:24 PM..
Changed my mind, stripped down the squirter block, took it to Motor head machine shop to get it magnafluxed, cleaned, bored for wisecos forged pistons. Line bore and deck if needed. Last edited by haltechsupra; 10-08-2016 at 03:25 PM.. Slowly making my way from junk shiz to new shiz. Last edited by haltechsupra; 10-08-2016 at 03:27 PM.. Probably, cheaper in the long run. When a piston fails, it is rarely limited to just the piston that gets damaged. 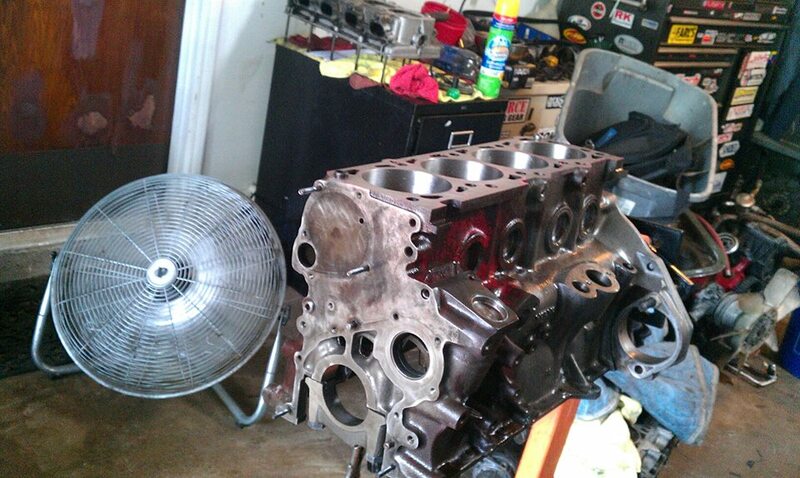 Got word back from machine shop, bore has been done, now they need to deck it, as it is twisted from corner to corner. I will have it back Tuesday along with the new rods and start reassembly. I can't wait! Hopefully my house, and the machine shop, will not be under water by then, as we are getting hit with severe storms and flooding again, pretty much a recap of last memorial day In Houston Texas. Happy Memorial day to those who are the family of the deceased that have served for our freedoms! I am sorry for your loss, and i am appreciative for their service. If it's twisted like that, check the line bore on the crank. That's what i thought too, but, it was reported fine, just the edges of the block diagonally were "turned up" a tad.When i pulled the working crank out of that block, there was no uneven wear pattern in any of the main bearings or journals, however the thrust bearing on rear was pretty -eh, "used up". So i asked for specs of how far out, and he said I have to mic it" , sounded fishy (like wtf are you calling me for if you have no specs, and mic on head, isn't that a feeler gauge type deal-with a flat bar?! ), "hey your block deck is twisted from edge to edge" he says, i say "really how far?" he says, "i don't know i will have to check it tuesday" mmmkay then????... So i wait, and hope , and pray..Not to mention all of this costs as much as the pistons did, I'm like whoa nelly?!! I didn't know you guys cost as much as Hennessy , or i would have taken it there instead.. My head itches right now. My heart is writhing in pain, did i make another bad choice?!!! 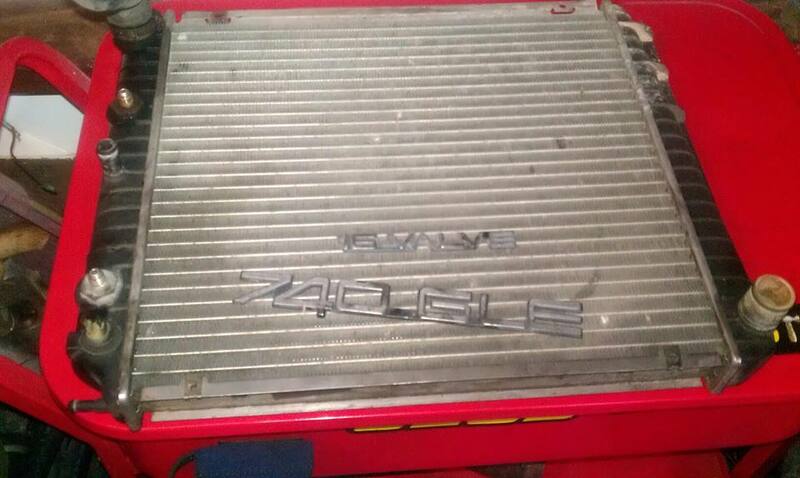 We will see.Reminds me of the two 16 valve heads that got ruined at another local houston machine shop. "How much did you shave off the head deck" i ask.. The answer "just enough to make it flat" I was livid -i even specified, tell me how much it's out and how much you need to remove, NOPE NEVER THAT. I remember spending half the amount of money to bore, line bore, and balance all my supra stuff, and even less to bore and oring a b23ft block back in the day..I'm getting worried, should i be? It seems lately-I measure more on my junk stuff than machine shops seem to do on a daily basis around here.I hope this one doesn't follow suit, or it's really gonna cost me now. Hopefully i am just jumping to conclusions, we will see. When a block fails, it's very rarely just the block that is affected. 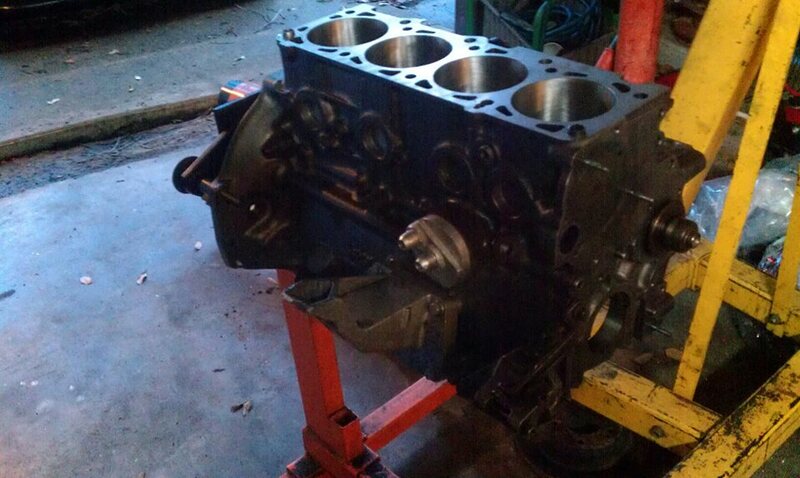 Just to clarify, a piston did not fail, Until-the block had came apart from a split in the bore. 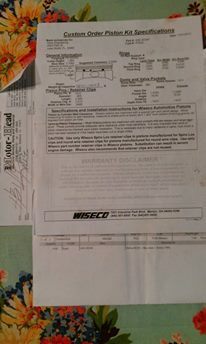 (could have been split from improper storage by previous owner-water in it and froze, or could have been overheated, or who knows)I knew it ate Antifreeze from day one but could never see a leak , not even with a Radiator pressure test(i always tested it cold_DUH) I did not know, and kept running it till the bore gave out,UNDER VACUUM, then the piston failed, as the broken bore momentarily seized it- then the stock volvo wrist pin broke in half, the piston sheared away from wrist pin -and the rod, in many bits and pieces, as any stock piston would -or even a forged piston- for that matter.The rest of the top of the piston stayed at top of bore and got beat into the four valves repeatedly before i shut it off by the relentless flailing h beam rod. 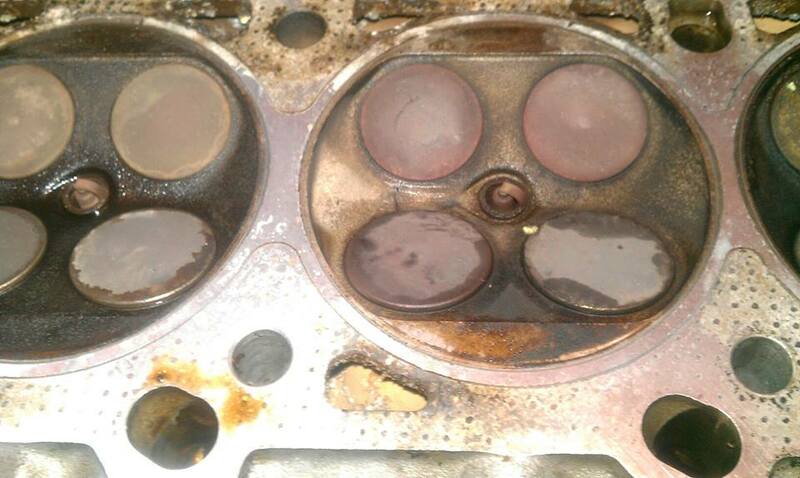 Piston was not the cause, it was the effect. Any crumbling bore will break a piston apart on the way up, or the way down as the piston will try to walk sideways in the bore without the proper wall there to guide it, as can be seen on Kenny Howard's split bore- that happened a week after mine (under much more power for sure). His "scuffy" skirt was getting ready to kick out and cause damage like mine from (axial?) flex of the broken or split bore moving around -a little more than intended to. I would be scared to run that piston again, but to each his own, i have run worse..With less fear. ha ha .Albeit a bit slower.. Much props. I got my block back from Motorhead Machine, turns out their prices are pretty comparative for the area, and their work appears to be on point. I feel happily humbled at this point. Line bored, honed, decked, magnifluxed $470 out the door. Looks like the 93 squirt er block got bored .20 over, with.004 clearance for forged wisecos. Last edited by haltechsupra; 10-08-2016 at 03:29 PM.. I decided to clear coat the block with 2000 degree f VHT clear satin paint. Patina. Last edited by haltechsupra; 10-08-2016 at 03:31 PM..
.0040 over, maybe i need to fill the block.. gulp..